If you have pets, it probably seems that you’re fighting all summer every summer to keep them flea-free. Unfortunately, this isn’t always easy, and sometimes, especially if your pets wander outside or mingle with other animals, avoiding fleas is impossible. That’s where Eco Tech’s pest control experts come in. When you’re at your whit’s end without an effective way to rid your pets of fleas, and when these fleas have infested your home, don’t try to take on the harrowing flea extermination process yourself; hire the professionals, who know where to find fleas, how to rid them from your home, and how to prevent them from repopulating before they’ve been completely exterminated. Serving the Minneapolis and St. Paul, Minnesota, area, our experienced exterminators have the equipment, treatments, and skills needed to quickly rid your home of fleas for good. When you first realize your home is playing host to fleas, it’s crucial that you don’t ignore the signs or put off flea extermination treatment for a later day. Because flees repopulate so quickly, it’s imperative that you begin the flea removal process as quickly as possible so that you can prevent them from reproducing before you’ve completely removed them from your home. It’s also important to keep in mind that because fleas reproduce quickly, they’ll not only add to the initial infestation, they can replace the first infestation if you don’t have every flea removed immediately. 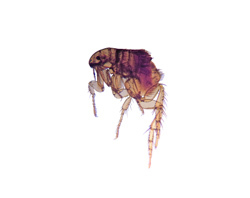 Fleas can hide just about anywhere in your home, especially if you have a dog or cat with fur that’s perfect for fleas, but fleas will also make a home in your carpeting and furniture, eventually jumping onto the people in your home as well. To make sure that the flea infestation in your home doesn’t reach the point where your ankles are covered in flea bites, call in our exterminators for professional flea extermination treatments that will ensure every flea in your home is removed. At Eco Tech, we’re committed to making pest control as stress-free for you as possible, but we also know that there are concerns many exterminators won’t address when using pest control treatments in your home. For many homeowners, especially those with pets and children, having a safe treatment is just as important as having an effective one. That’s why we’ve created an all-natural, organic flea extermination treatment that’s less toxic than traditional pest control treatments, which can be harmful if ingested. To see for yourself just how effective our exterminators and natural pest control treatments are, call 612-237-8282, 651-633-8600, 952-881-6662, or 763-785-1414 to schedule an appointment to begin the flea removal process in your home. For emergency 24-hour service, call 763-232-7296.